Three Servings of Grapefruit /Day Have No Effect on Weight Loss, But Increase Triglycerides and Make a Potentially Deadly Cocktail With A Whole Host of Prescription Meds! Image 1: Grapefruit does not help with weight loss and, as it turns out, is not even healthy. On the contrary, in conjunction with your favorite statin it is even potentially deadly. 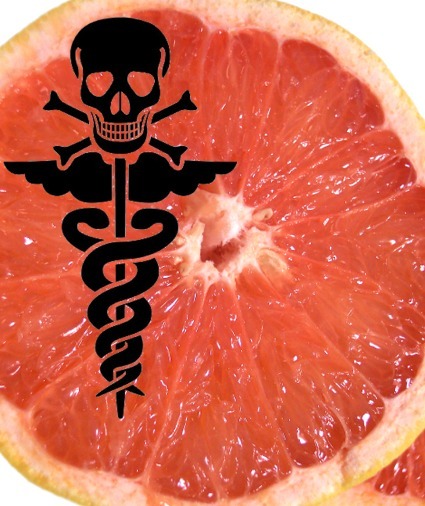 Do you remember the "grapefruit diet" (WebMD)? No? Well, then you are probably male and have always been satisfied with your weight. Otherwise, you would probably have heard how a "magical ingredient" in the subtropical citrus fruit is going kill all those unaesthetic adypocytes, which have made themselves at home on your hips and buttocks, in no time... What do you say? Bullsh*t? Well, I guess you have been reading to much of my stuff already, after all this purported short-cut to six-pack abs is also known as the Hollywood Diet and that alone will have people fall for it by the dozen... I mean, if Brooke Shields and Kylie Minogue got in shape with it, it must be working, right? control group (n=32) continued eating the "wash-out diet"
The dietary intake of the subjects, was evaluated with your usual (unreliable, but in want of alternatives obligatory) repeated 24-hour diet recalls (3x during the washout phase and 3x during the intervention phase). Things like the total caloric intake (1800-1900kcal) or the macronutrient composition did not really differ between diets - in other words: The scientists did a pretty good job to isolate the grapefruit intake and the (obviously) correlating vitamin C intake (cf. figure 1) as the single confounding factors in their study. Aside from the fact that grapefruit does not make you lose fat, the graph in figure 2 carries another important message, which is: Never use a body impedance device to track your progress. And this goes for all those stupid things, and not only the Omron Body Fat Analyzer HBF-306 which was used in the study. Why? Well, take a look at the body fat and the waist circumference data: How can your gut become smaller, when your body fat percentage increases? The answer is easy, because the grapefruit eaters lost water, they lost ~1% more of their waist circumference. This did yet change the impedance of their bodies so that the stupid for the Omron was tricked to believe that the body fat percentage of the study participants had increased (if you are at a loss how you can track your progress, make sure you read the Intermittent Thoughts on "Stocktaking, Goalsetting, -Tracking & -Resetting"). associated with CVD risk reduction. Just to make sure nobody is missing the point here, neither the inter-group differences in LDL reduction nor the different outcomes as far as the trigs are concerned, reached statistical significance, but against the background of the results of the meta-analysis of Kannel and Vasan from 2009 and recent findings on the contribution of elevated triglyceride levels to the etiology of cardiovascular and metabolic diseases, I personally feel that beyond not helping with weight / fat loss, eating grapefruit could potentially even contribute to, or aggravate existing metabolic disturbances. If you are on any medication grapefruit is a no-go, anyway! 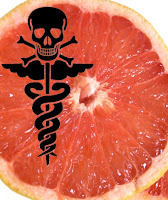 Yet even if you don't care about the pro-diabetic effects of triglycerides and discard the non-existent effect of grapefruits on weight loss / body composition, there is another, probably more important, because potentially fatal side-effects of eating grapefruit (or drinking its juice / taking respective supplements), which relates to the inhibitory effects it exerts on a hitherto not fully elucidated number of liver enzymes in the cytochrome cascade (CYP), which is heavily involved in drug and hormone metabolism. So, even if you don't take a statin, of which Dreier et al. have shown that it can induce profound rhabdamyolysis (=total break down of muscle protein, which can lead to kidney failure and death), when the grapfruit flavenoids and polyphenols block its metabolism in the liver (Dreier. 2004), or any other of the countless drugs the effects of which are profoundly modulated by the ingestion of grapfruit or grapefruit juice (Hanley. 2011), you better stick to no more than a single grape-fruit once in a while... I mean, it has no beneficial health / weight loss effect, anyway.